Vipassana International Academy at Igatpuri was established in 1976 The aim was to conduct Vipassana Courses for those in search of mental peace and harmony. 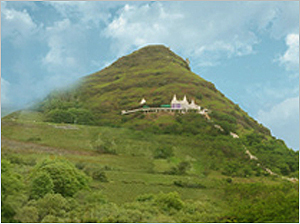 Known as Dhammagiri, it is located in Igatpuri, 40 kms away from Nashik City by Nashik-Bombay-Agra road.This world famous meditation centre offers techniques which relieve mental stress and promote inner peace. It is turning the wheel of time conversion from Kalchakra to Dharmachakra under the able guidance of Guruji Satyanarayan Goenka. A 10 day residential course at the centre, which is free of charge, ends with Bhavatu Saba Mangalam meaning May all beings be happy. Dist. Nashik, Igatpuri – 422403. Tel: (02553)244 – 076, 244 – 086, 243 – 712, 243 – 238. Fax: 244176. (10 am to 5 pm). Nashik City and the surrounding area is famous for many temples, pilgrimage places etc. One of the sacred places for Jain Religion is Teerthraj Gajpantha , which is at Mhasrul, 16 kms from Nashik Road Railway station and 5 kms from Nashik City. The famous CHAMBER CAVES are a part of this place. It is situated on the top of a small hill which is only 400 ft tall. The staircase, built in black stone leads to the temple and offers a panoramic view. Although the nearby landscape is quite barren, some plantation has been recently done. This is a very serene place, conducive for meditation. Gajapantha Teerth includes a caravanserai, a small hut the foot of the hill and a temple at the top of the Gajadhwaja Hillock. As per the ancient holy book “Shantinath Purana” Mysore’s Chamaraj King installed these statues (600 B.C.) in the temple top the hill. Thus the caves got the name “Chamer Caves” or “Chambhar Caves” in the regional language. Human mind is full of feelings – good and bad. To eliminate bad feelings, one tries to visit pilgrimage places, where the influence of the holiness of the temples and God brings serenity to human minds. That is why many temples and pilgrimage places are found all over the world. India is very rich in this aspect. Maharashtra and the City Nashik is famous for temples. “Teerth” is a place , where saints do meditation and finally get “Moksha” – salvation . This place then becomes a pilgrimage place. Teerthraj Gajpantha is one such place, where, it is believed, at seven Balbhadra (saints) out of nine of Jain Sect got salvation. They are known as a) Vijay, b) Achal, c) Sudharma ,d) Suprabh, e) Nandi, f) Nandimitra and g) Sudarshan. The seven Balbhadras also took along with them eight crores of Yadav Kings to salvation from his place. That is why this place is very auspicious for jains and is frequented by Jains through out the year.This place is on the Nashik Gujarath road. It has an access to rail, bus and by air too. Being in the vicinity of Nashik City, it has all the metropolitan facilities. One can get taxi or rickshaws too to reach this place. To trace back the history of this place and to establish the period when this temple was built, one can get some relevant references in ancient literature. A story in Shantinath Charit goes like this – Amittej and Vijay tried to chase Vidyadhar. Unable to find any shelter , Vidyadhar went and took shelter on the Gajdhwaj Hillock.This certainly establishes that Gajpanth Hillock was known to be existing on the outskirts of Nashik City then. In fact Gajdhwaj and Gajpanth are one and the same – they are the names of the small hillock , in which the Chamer Caves are housed. The ancient literature also has a mention of the vicinity of Anjangiri – a hillock named Anjan, near Gajadhwaja. Dharmashala is in the north of Mhasrul village. It is an old caravansary which is surrounded by a fortification. In its vicinity is a Jain Chaityalaya. This temple is 100 years old and houses a statue of Mahaveer Bhagwan, which is 25 inches tall. It is in Padmasana Mudra. The statue was installed about 100 years ago. To its left is Adinath’s statue in Padmasana Mudra. In addition to that there are 31 other statues, which include seven Balbhadras and one Gajkumar statue. In front of the temple is a big tower which carries four sculptures of Mahaveer Jain. The tower is surrounded by beautiful garden with a well of tasty water. Saraswati Temple has come up recently nearby. Recently a public school is also opened up. In addition to these there is Mehta Dharmshala in the premises. 26 acres land belongs to the turst. Dharmashalas are equipped with the necessary amenities for visitors. The temple and Dharmashalas have been developed at the instance of Bhattarak Kshemendra Kirti, who, on his way to pilgrimage visited this place about 150 years ago. Only the Gajadhwaja temple existed then. Considering the religious importance of this place, he thought it necessary to develop this area. As per his wish, Sheth Nanchand Fatahchand from Sholapur purchased the land and built Dharmashala. At the foot of the Gajadhwaja Hill, there is a beautiful garden. 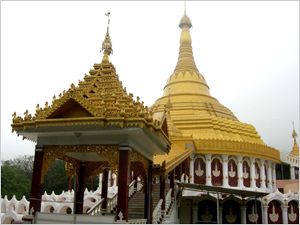 Near the garden is the Samadhi ( shrine) of Kshemendra Kirti. There is also a temple which has Mahaveer statues in four directions. From this temple goes the staircase to the Gajadhwaja Hillock. As you climb up the hill and enter the temple, there are Shweta Charan of Sudarshan, Nandi and Nandimitra Balabhadras. Further down there are Shweta Charan of Suprab, Sudharma, Gajkumar, Achal and Vijay Balbhadra. There are two newly constructed temples. A sculpture of Bhagwan Parshwanatha was found during excavation. It is a beautiful , 10’4″ tall statue in gray colour. Seth Shobharam Bhagwandas from Pune helped in reinstallation of this statue. The other temple is built by Jivaraj Gautamachandji from Sholapur. It houses on the left side a 1’5″ statue of Bhagwan Padmaprabh and to the right a statue of Bhagwan . Nearby are two cave temples. The creator of these temples is unknown. The statues in these caves have been set in cement plaster. There are many statues near this temple. On the opposite alter there three sculptures of 4’5″ and four pillars in front of these sculptures. The pillars are decorated with the carving of Padmasana on the top and a chain in the middle. The sculptures are of Mahaveer and gods worshipping with flower garlands, musicians with musical instruments etc. Till 1989, the trust was not in a financially sound condition. But now it has improved. As a outcome of this, the trust has opened up a public school and shelter for old people. Both the public school and the shelter for old people are well equipped with the day to day necessities. On the 14th day of Magh ( 11th month as per lunar calendar) there is an annual gathering when Jalayatra and Gajaratha ceremonies are celebrated. They have a caravansary in Nashik City too.